Vivekananda Kendra Arun Jyoti ,Arunachal Pradesh recently organized one Free Operation Camp at District Hospital, Khonsa, Arunachal Pradesh. A team of Four Doctors from USA and Nagpur,Maharastra came all the way to serve the poor and needy of Tirap and Longding districts of Arunachal Pradesh. The camp was inaugurated on 16th November by Sri Chanwang Lowang, ZPC of Tirap district. A total 56 patients were operated during the camp for various ailments like Gall Bladder stones, Appendicitis, Hernia, Hydrocele, Ovarian Cysts etc.and all the operations were successful. It is to be mentioned that in this year, this was the fourth surgical camp organized by Vivekananda Kendra in Assam and Arunachal Pradesh. 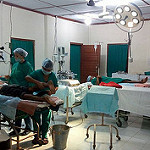 A total 194 surgeries were conducted in these camps.